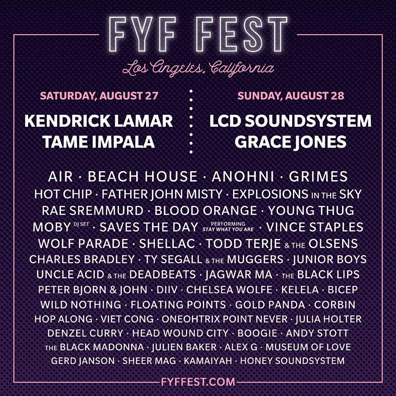 FYF Fest has announced its 2016 lineup and it's another impressive one. The event is due to take place August 27 and 28 at LA Sports Arena and Exposition Park. Saturday will be headlined by Kendrick Lamar and Tame Impala and Sunday will be headlined by LCD Soundsystem (who seem to be playing every festival this year) and Grace Jones. Also set to play are Air (in their first U.S. show in five years), Beach House, Grimes, Hot Chip, Father John Misty, Wolf Parade, Ty Segall, DIIV, Wild Nothing, Chelsea Wolfe, Blood Orange, Todd Terje, Julia Holter, Julien Baker, Jagwar Ma, Peter Bjorn and John, Viet Cong, Junior Boys, The Black Lips, Explosions in the Sky, Charles Bradley, ANOHNI, and many others. Saves the Day will also be performing their album Stay What You Are. The full alphabetical list of performers is below. Tickets go on sale this Friday, April 1, at 12 PM PST via FYFFest.com. Weekend tickets cost $199.00, single day tickets are $125.00, and weekend VIP passes go for $339.00.